NASA astronaut Serena Aunon moves tools and equipment underwater during NASA's NEEMO 20 mission, which began July 29. It's a tech geek's dream fulfilled in the underwater lab hosting four "aquanauts" for 14 days this month, where they get to practice space exploration with a cutting-edge Microsoft virtual-reality headset. Microsoft's HoloLens, whose augmented-reality technology overlays a virtual display on the real world, will someday go to space itself to assist astronauts, and the NEEMO 20 underwater crewmembers are testing it out during their stay, which started July 20. A HoloLens was also supposed to fly to the International Space Station but was lost when the Dragon spacecraft exploded during launch June 28. A second set of holographic lenses from another manufacturer, as well as several tools that could be used in future asteroid missions, is also being tested underwater. "We can learn about interaction between crewmembers and the ground control," Parmitano said of the mission in a televised interview on NASA Television. "We can learn about procedures and ways to make our work effective." NEEMO, which stands for NASA Extreme Environment Mission Operations, takes place in a trailerlike habitat 45 feet (17 meters) underwater off the coast of Key Largo, Florida. This mission is focusing on techniques that could be used for deep-space exploration — such as on an asteroid or Mars. Going farther out in the solar system will require crews to work with a time delay, since it takes a long time for communications radio waves to travel there and back to Earth. On Mars, the one-way delay could be as long as 24 minutes. That's why NEEMO is testing out time delays on Earth first. 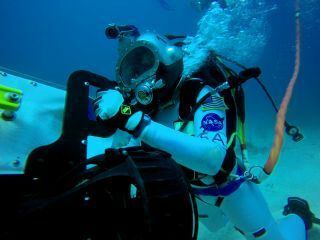 On previous missions in 2014, astronauts practiced underwater "spacewalks," where they would move in a circuit, synchronizing the length of the circuit with the length of the time delay. By the time the astronauts reached the beginning of the circle again, ground control would have time to look at images of the journey and provide feedback on what to do next. For this month's mission, astronauts will also simulate the different gravities found on asteroids (which are very low) and Mars (which is about one-third the gravity of Earth's). To do this, scuba-diving astronauts will adjust attached weights to become more or less neutrally buoyant. NEEMO 20 will also help out with some nonspace science by investigating coral. Although the Florida Keys are rich in coral, scientists have noted that the corals appear to be migrating deeper into the water. Researchers think climate change — and the associated rise in ocean temperatures — is forcing the corals into cooler areas. During their "spacewalks," the crewmembers will collect samples of the corals and return them to the surface. They also will install transmitters to record environmental data such as depth, current and temperature for better environmental monitoring. "Corals are an excellent marker of how the environment is doing," Parmitano said. The full crew includes Parmitano (a veteran of Expeditions 36-37 in 2013), never-flown astronauts Serena Auñón (NASA) and Norishige Kanai (Japan Aerospace Exploration Agency) and David Coan, NASA EVA management office engineer.Two technicians, who are also professional divers, live with them in the habitat to run the facility.